10 x 14 in - 25 x 36 cm. 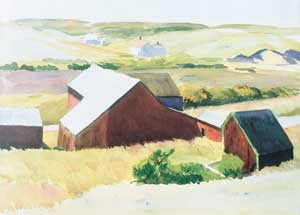 There is an unfinished Edward Hopper watercolor - Cobb's Barns and Distant Houses, 1931. I took a segment of it to use as the shapes at the center of this work. 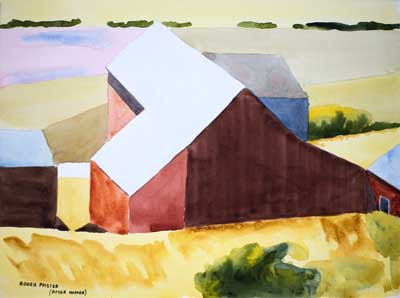 The intent is that you see the abstraction of the shapes while still getting the presence of the original barns. It has turned out as I intended, which is not always the case with watercolor. I wonder if I should have enhanced the abstraction a little more?